After a string of indoor workouts, I was ready for an outside run today. The news stations were predicting heavy rains starting mid to late morning and that helped get me out the door early. I quickly dismissed a run around the neighborhood (too dull of a route on an already gray day) and decided to visit the trails at Stillwell instead. Stillwell's lot was fairly empty when I arrived, and I thought that people might be avoiding the woods and the fields due to the imminent rainstorm. I'm always happy to have the trails to myself and felt excitement as I headed toward my favorite route. Once I took a left off the initial trail that leads to the black trail, I saw that my usually well-groomed paths were frozen and muddy. The packed single track was scored and deeply rutted by mountain bikes. Due to these conditions, I needed to constantly switch from one trail edge to another because the thawed sections of mud were too unstable. I'm always concerned about tripping on a trail, but in this case it could have resulted in a face full of mud or an injury from the frozen terrain. As I made my way north, I started to think about which section might be free of mud and followed a trail that is usually covered in leaves. 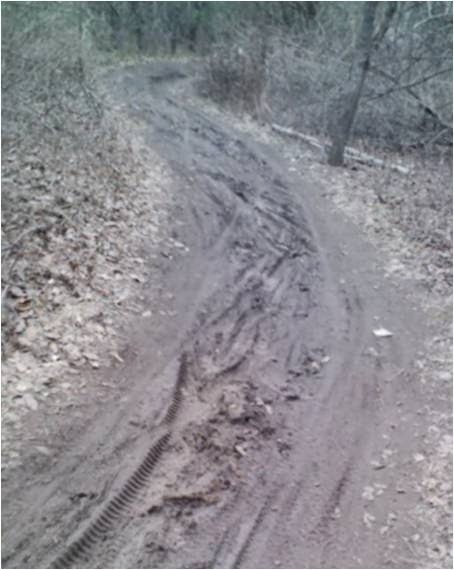 That trail was much more stable, and while it gives way to a sandy section, that was preferable to mud. I was surprised to see some hikers on the trail, as well well as mountain bikers. I was the only runner as far as I could see. I didn't do my usual two loops because the thought of repeating that first muddy mile was unappealing. That gave me the opportunity to follow some different trails that I've somehow avoided over the past year. Even the better trails had mud and ruts, so after three miles I decided to head back. I'd originally planned another loop around the open field that would have added another mile. When I got close to the trail head, I saw a group of ten mountain bikers coming into the woods. One of them told me that I was very visible (I was wearing my bright orange long sleeve jersey) and I called back, "That's the idea!" As peaceful as it is to run in Stillwell, the danger of being mowed down by a biker is always there. One day I'd like to run that route with you. Maybe we can get A to join us..? I'd love to run Stillwell together! A did not express much love for running trails a few weeks ago, but we can probably trick her into it. I will definitely try Stillwell, if only to entertain you when I faceplant in the mud. Hopefully, C will have her magic glasses on to record the mishap.